Well it’s the time of year again, albeit later in the year, but here nonetheless, to get out and do some spring cleaning. 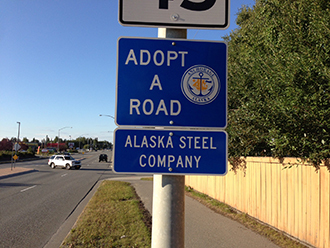 Alaska Steel is proud to be a part of the “Adopt a Highway” program. We have a section on Lake Otis that spans from Abbott to Dowling Rd. Alaska Steel employs some of the best people out there, we always have a great turnout from our team. Thanks to everyone that made this year’s pick up such a great success!